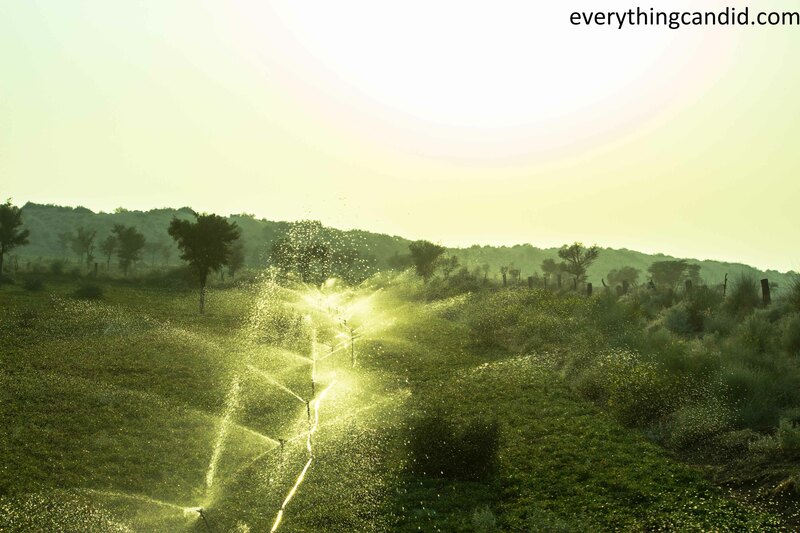 It has always been an intriguing fact that I live in Delhi which is only 500KM from world’s 9th largest desert i.e. 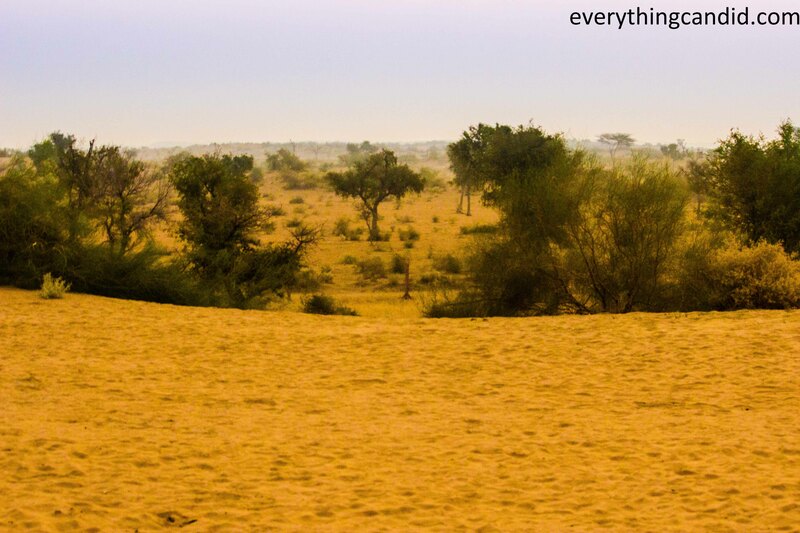 Thar Desert. So, finally, I decided to quench my thirst to go deep through the desert and sleep under stars, see the rising sun from top of Sand dunes. Although I wanted to reach sand dunes driving my car but it was just not possible, so decided to live another fancy of riding a camel. For me, if ocean represents peaceful vastness than desert being ocean of sand represents a metaphor of rugged vastness. Blue Ocean offers tranquility while golden desert challenges the inner self. While sailing thru ocean you are not sure of the depth, but in desert you are always grounded by surroundings. My Desert Safari was operated by Mr. Vijay the original and only Camel Man from Bikaner. My wife and I hired two separate camels named Raja and Boss. 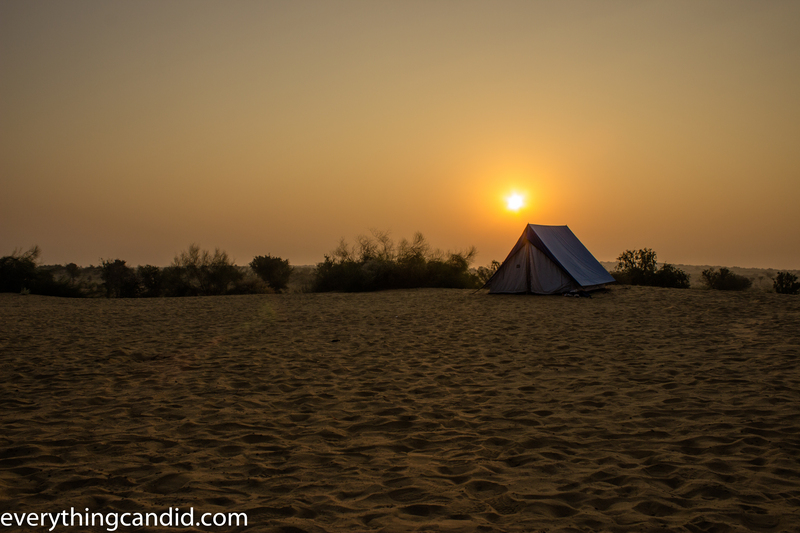 The plan was to go 12 KM deep in desert and spend a night on sand dune and come back in the morning. On our way to San Dune for Night stay! We started from Himatsar at 4 PM and after settling with rhythms of the camel in sometime, we started to enjoy our barren surroundings. 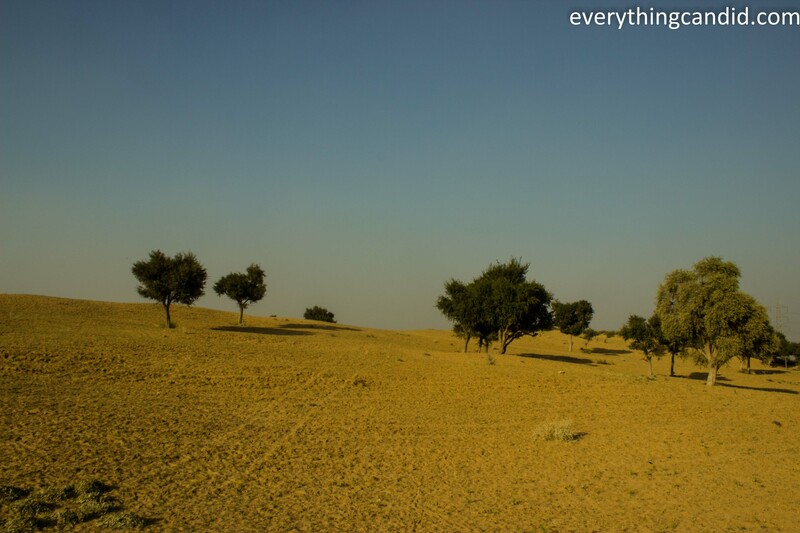 I must admit Thar Desert is certainly not the most picturesque of deserts as it is primarily a scrub desert, full of small shrubs/sedges and tall tree of Sangri. However, it has its own surreal beauty and occasional sand dunes makes entire scene awestruck. 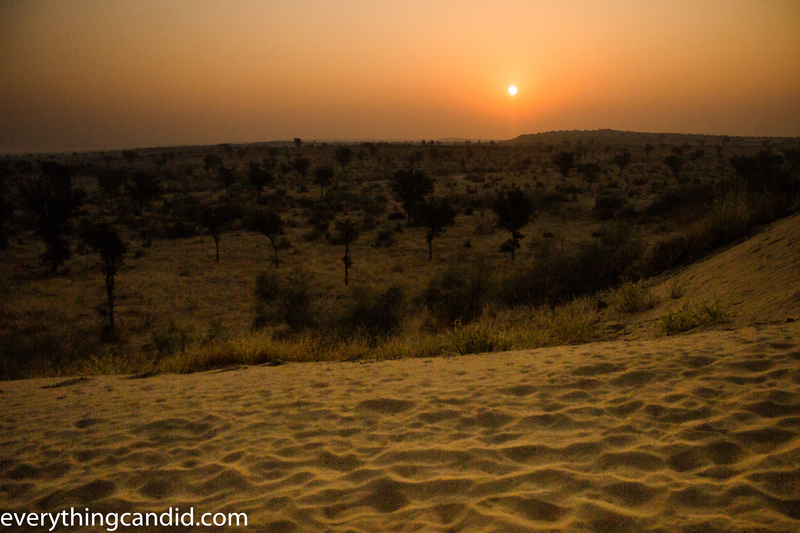 Our safari meandered through Groundnut crop fields and myriad sand dunes, finally concluded at designated Sand Dunes in Napasar at 6PM to witness the sun set. Sunset was never so beautiful! Our safari guide Mahender and Mukesh, served us with High Tea and erected the tent for night before starting the preparation for the dinner. 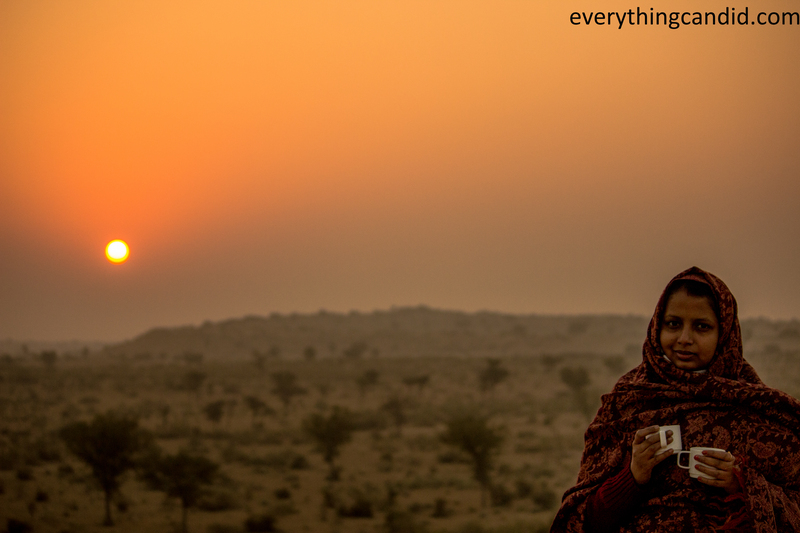 Witnessing the arid vastness of the nature while sipping a cup of tea made us feel so humble and we spent quite a time without talking. This speechlessness I experienced earlier in Chhitkul on the bank of Baspa River in Himachal and many times earlier while sitting on Marine Drive in Mumbai amidst drizzling. After this moment of truth, we set next to campfire and later enjoyed our candlelight dinner under the starry night. We were served with simple, deliciously home-cooked meal, however, for us, it was the most splendid dinner ever. No sound, no noise but only reverberating silence was omnipresent as if some melodious lullaby inducing sleep. While crawling inside our blankets we had a sense of contentment which we never felt before because earlier, we never slept under star studded sky so away from city life and in the vastness of nature. Contentment was for accomplishment, few more ticks in bucket list. Our tent for the night! 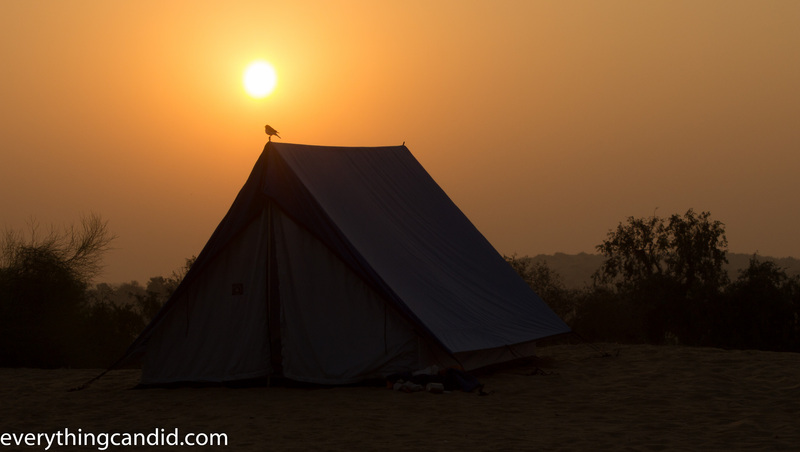 In the morning, we get up early to observe sun rise and captured some nice early morning shots. Early morning Shot from Sand Dune! The offbeat part of the morning was when I took a power nap in the nature’s lap. It was the perfect way to absorb the essence of the desert and mother earth never looked as beautiful as it looked that day. Groundnut Field during camel ride! Evening Golden Hour from San dune ! Clear blue sky over golden sand! Tea Time…couldn’t ask for more! Loved this shot taken by Wify! 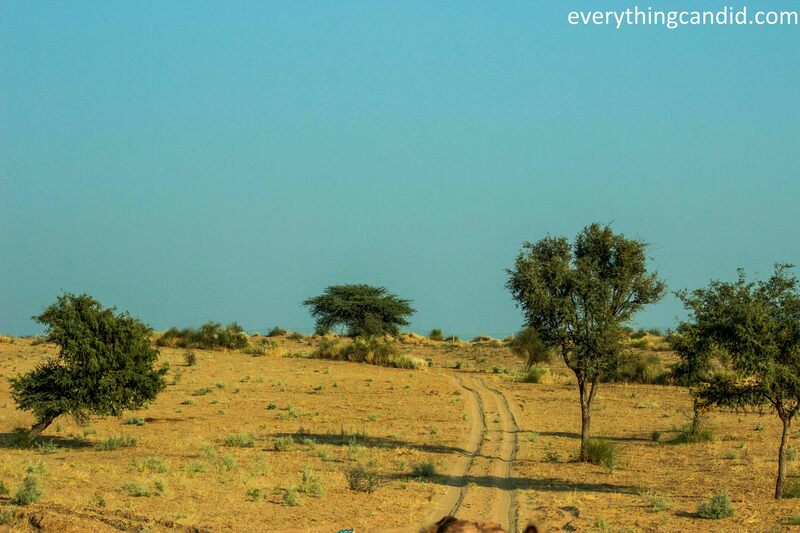 Impact of Thar Desert on my psyche was as mesmerizing as when first time I witnessed the vastness of Indian Ocean in Goa or Might of Himalaya in Mount Aparwath in Gulamrg. As a person who is passionate about experience offbeat things in offbeat fashion, this desert safari experience was of supreme fulfillment. At last I realized, desert is the exact metaphor of optimism. When we are in the barren and arid desert we are holy optimistic and courageously face whatever Goddess of nature throws at us and in doing so always search for oasis of opportunities. This part of earth will always be imprinted deep in my mind for years to come! P.S. : Camel Safari is available at Bikaner, Jaisalmer and Jodhpur and all of them offer different experiences. 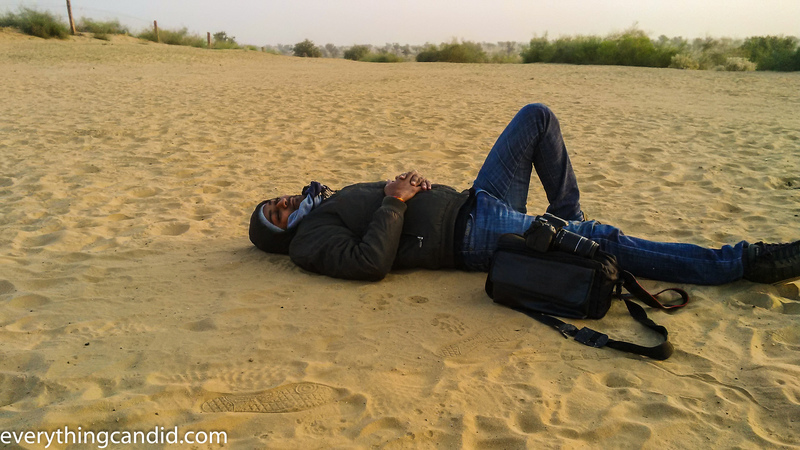 Bikaner is less popular option and thus I preferred it for my first and candid desert safari. 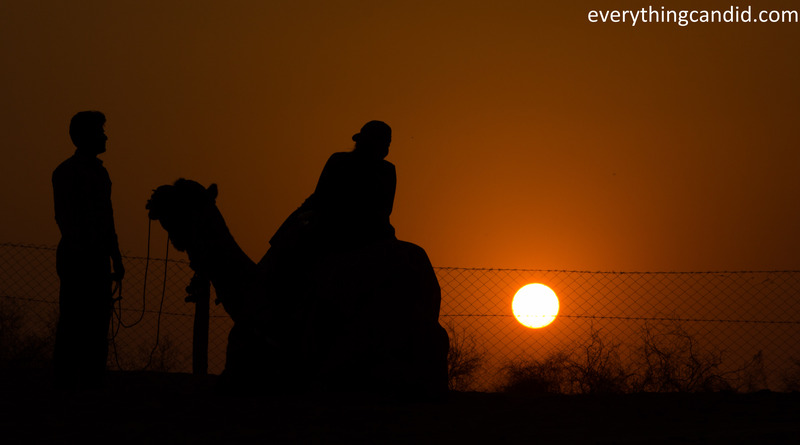 Camel Man from Bikaner is organizing first ever desert night on 31st December at their sand dunes. 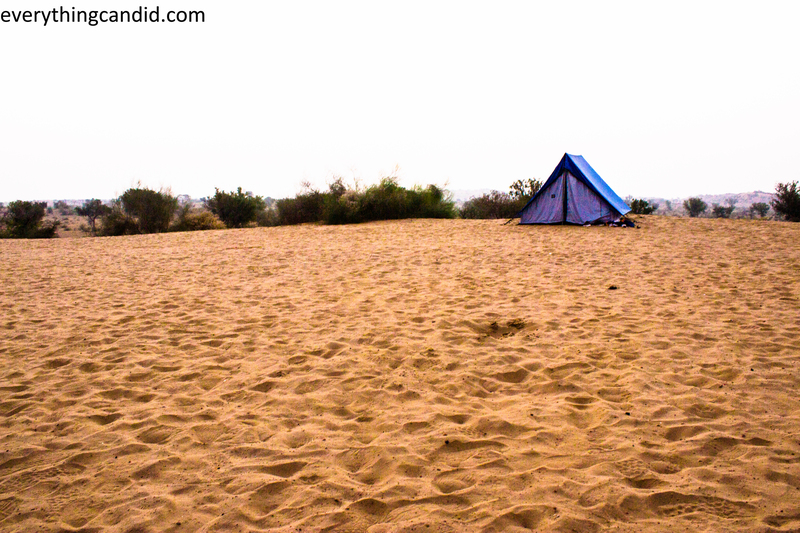 Yes guys, a new year party at Sand Dunes around 12 KM from Bikaner. I am sure it will be a different and out of the world experience. WOW, what a GREAT post. And what an AMAZING way to visit the desert, on a camel. Have heard the stars are so brilliant in the desert. Thanks for the link for the Camel Man. Great site! Good to c u like it. Yes, stars are starkingly brilliant. Sun set and sun rise both were too pristine and i was really confuse whether to capture them thru camera or just capure the beauty in my mind. The entire experience post sun set to morning power nap in nature’s lap was very intriguing. I am delighted that you could feel it thru my words. Although, i dnt thing i could do justice with my words to wat i felt. 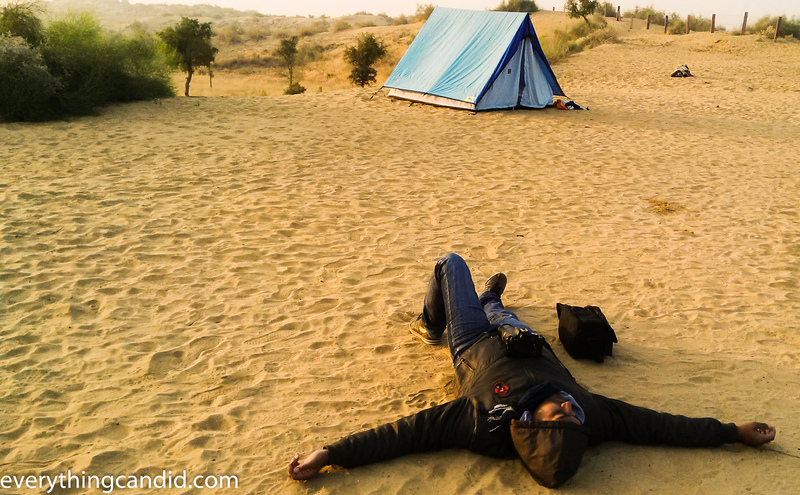 I am sure u must have enjoyed the camping in desert. the vastness makes one feel so small. It was indeed a great experience. Thanks for liking. I agree simple things which we usually dont notice makes life so beautifu. 🙂 yes, those hidden beauties and treasures of life can bring so much happiness. Cheers! Beautiful photos and I love the layout of your blog!! Thanks Natasha for the appreciation. C u around!! 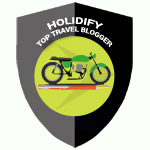 Gr8 job guys.. Ur story is inspirational, look forward to see your next trip post. Wonderful read. I would rather be in a more pristine desert than scrub but your experience sounds wonderful nonetheless. That ‘rugged vastness’ would be perfect. 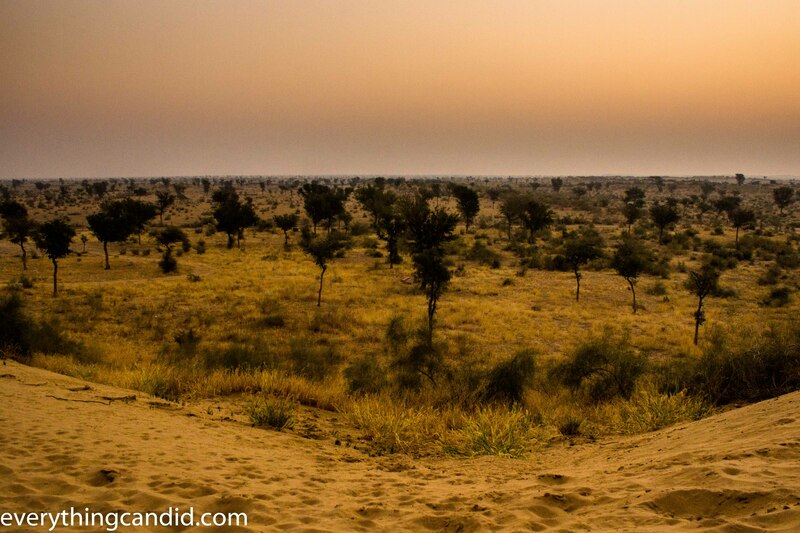 I’ve heard of desert safari in Jaisalmer and Jodhpur before but not at Bikaner. Do you know which one would have more options and variety in terms of activities, both in the desert & in the city, ? Bikaner is a new entrant….. Jaiselmet is more evolved and commercially stable. Jaiselmer must be better. 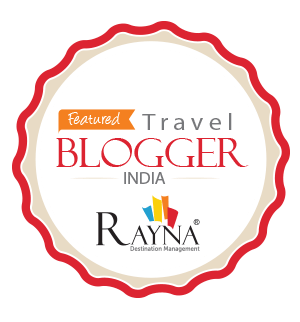 Super cool….. please share your experience. What a wonderful experience! Going on a camel safari is also on my bucket list. I love that you enjoyed the quiet and really appreciated all the dessert had to offer. 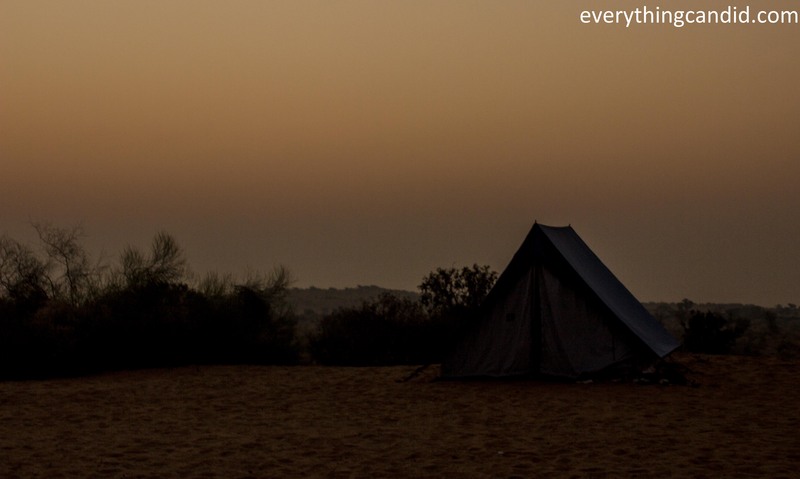 Must go for Camel Safari and also make sure you night camp in desert. Ah so envious! I’ve always wanted to travel to a desert and ride a camel! You write beautifully and brought me to the desert with you through your words. The desert wasn’t initially what I pictured, but nonetheless it has its own beauty. Thanks alot… you appreciation means alot. Desert is like a beautiful beast… and i love every aspect of it. I grew up in the Sonoran Desert and love everything about the vastness, the peace you find walking out into it. I’m so glad that you had such a great experience and riding a camel – I wanna do that!! 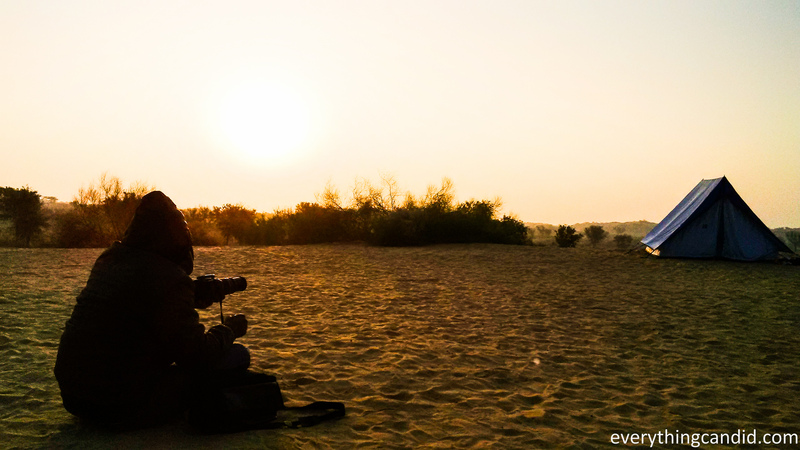 Good to have found you… deserts are mystic and in india they are the treasure trove of history and heritage. I love getting lost amidst desert. I loved getting to ride a camel in the deserts of the UAE. It is such an interesting animal to ride. I love getting to camp in the desert other than the sand. I hate the sand but the nights are so peaceful. Rajasthan is the Land of Royal Culture and Mesmerizing Forts. Rajasthan is best for Traveling in Winters. You can here Feel the Culture and Best Forts. This state is also famous for colors. Here people can visit The Best Forts and Royal Palaces.Rajasthan Tour Packages are the best for visiting Rajasthan at its best. What an amazing adventure!!! While I’m not keen on riding a camel, I’d definitely love to set camp in the desert: a candlelight dinner under the stars sounds like a treat! wonderful photos. That was a real experience – I know my parents used to camp out in the desert and said it was something special – your photos have really brought your travels there to life. I remember my dad was posted (he was in the Air Force) in Bikaner when I was really little and I don’t remember much except that we were frequently caught up in the middle of sand storms. I did not have the chance to go for a desert safari or a camel ride to the desert while we were there but I’ve done it in Dubai and it looks similar to what we have here. Love that you can also camp there, in the middle of the desert, just like you can here. And your sunrise pictures are pretty awesome! This is nothing like the Desert Safari in Dubai I went on. You got a much more authentic experience. 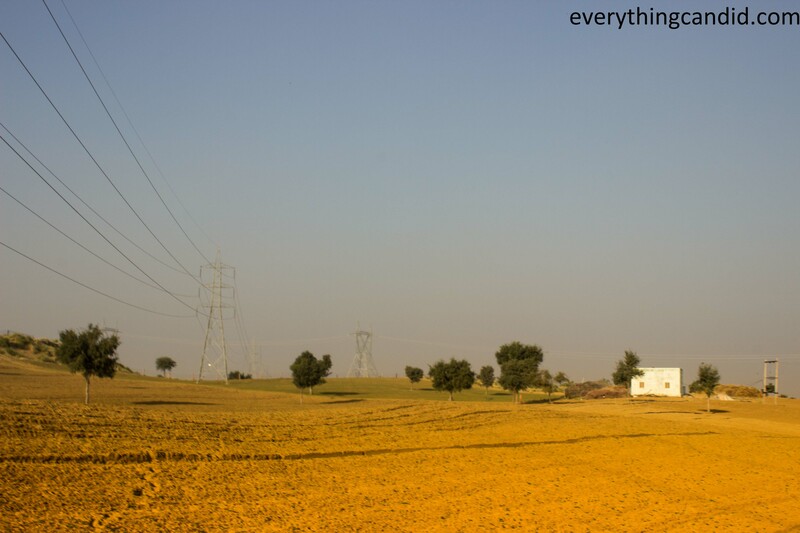 I’ve never even heard of the Thar Desert, and I hope to get to visit someday. Just another part of the world I’ve never been into. You’ve definitely sold me on that sunset. ‘Raja and Boss’, what fabulous camel names! 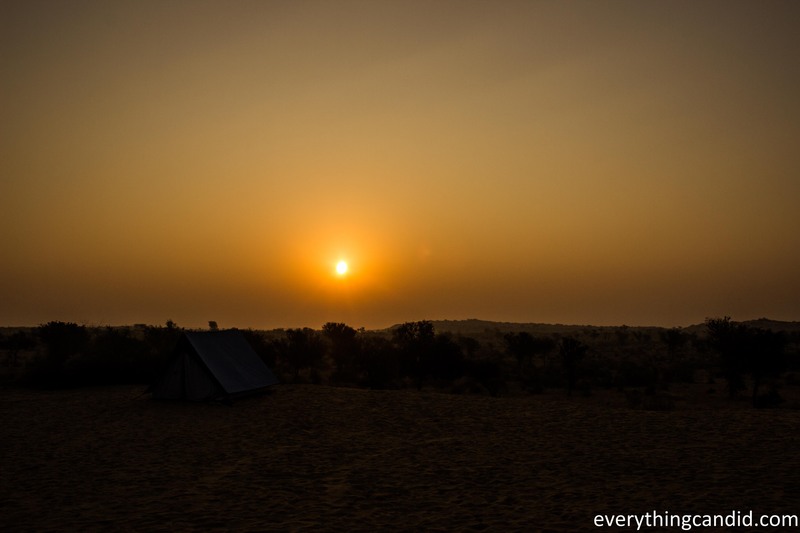 I love how you describe the peacefulness of the Thar desert, and the almost spiritual effect that sleeping out under the stars has. I can only imagine being that remote, with only the sounds of the camels in earshot. It is one of my dreams to do this. This must of been an amazing experience. I would love to ride a camel through the desert and camp under the stars. 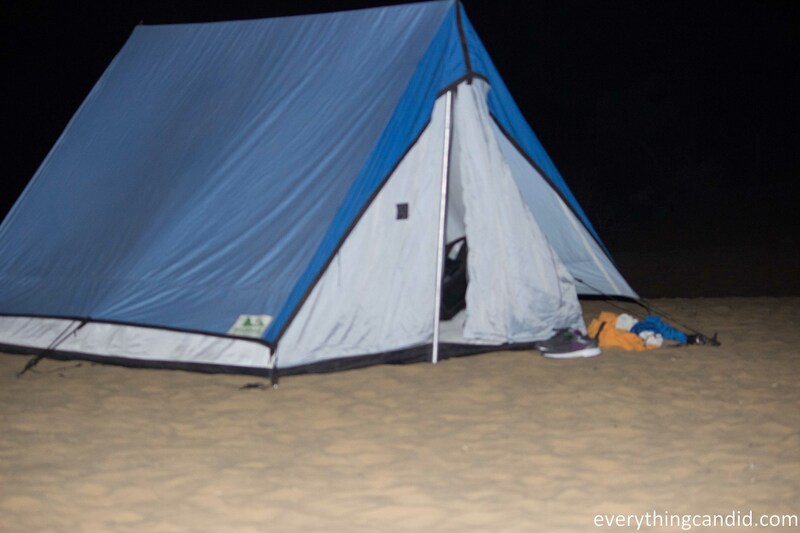 It must of been so quiet in the desert when you were camping. 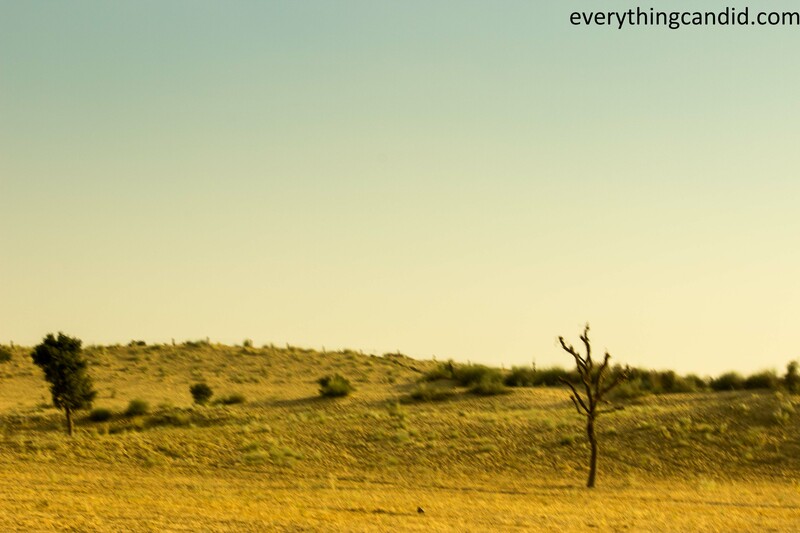 Your photos are fantastic, really captured the vastness of the desert. Great pictures! I had the opportunity to sleep in the Iranian desert, but without tent just under the starts, and it was amazing. I agree with you about the peacefulness of this kind of landscape, I also had this “humble” feeling. Was it hard to ride a camel? I never tried . .
yes its not hard to ride Camel. You gonna enjoy it. 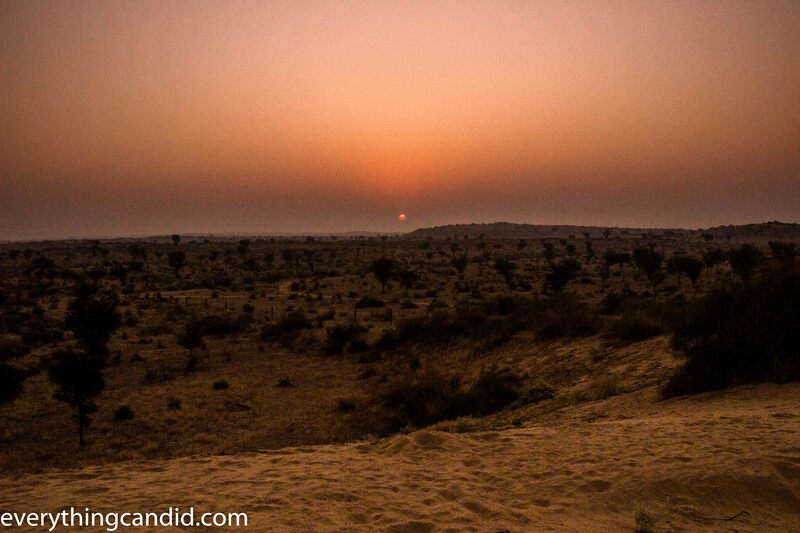 The dunes at sunset are spectacular – what an amazing adventure to camel ride into the Thar Desert. Such an authentic expedition! I can imagine that the silence would have been amazing – sitting there beside a campfire, sipping tea, amid the vast landscape. What an experience! It was a super cool adventure. Thanks for liking it. 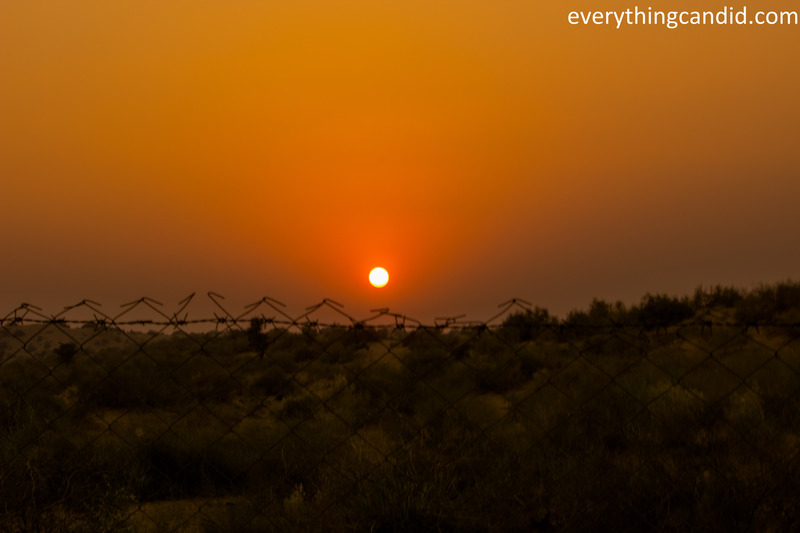 Rajasthan is indeed beautiful, this is a fact I can vouch for, having stayed in Rajasthan for some time. 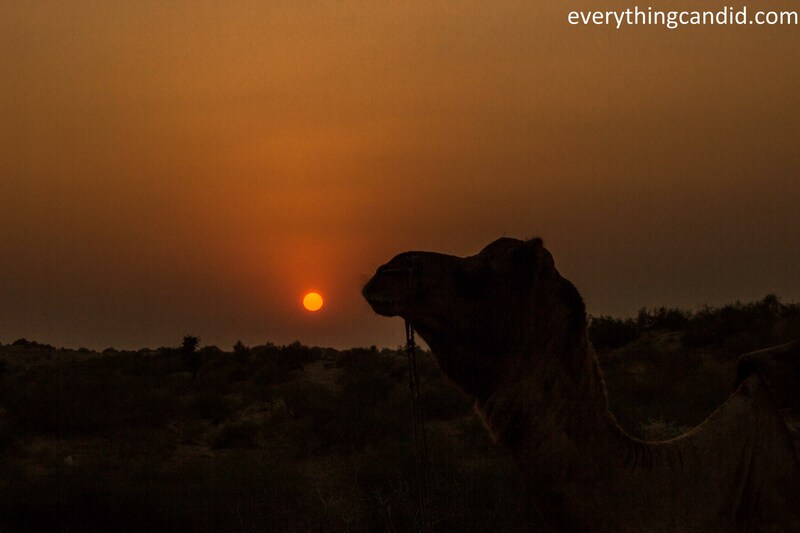 Though never got to be on a camel ride nor desert safari, but the desert state of India, has got a lot of charm in it. Beautiful photos though.